Needle felting is a bit dangerous for little hands although it can be done under supervision, but the needles are very sharp and stabbing oneself is very painful. Wet felting is ideal for little hands. What child doesn’t like to play in the soapy water in the dish sink? These instructions will include “supervisor tips” whenever available, these are the tricks we use to finish a project when little hands and minds might have wandered off prior to full completion! Wet felting is one of the oldest and simplest ways of making fabric. It requires no specialized tools or practiced skill and is easily available. Wet felting works because animal fibers have scales and the combination of water, soap, temperature change, movement, and friction cause the fibers to lock together. We humans use conditioner on our hair to help keep the scales from interlocking and creating tangles or what my mother would refer to as “rat’s nests”. You can think of wet felting as a bad hair day taken to an extreme! Take a small amount of wool and roll it into a ball, wrapping the fiber in different directions. Wet the wool in warm slightly soapy water. Wrap the second color of wool around the first tightly and wet the fiber in the warm water. Keep wrapping different colors around the ball and wetting. End with a nice natural brown or gray wool roving for the outside of the geode. 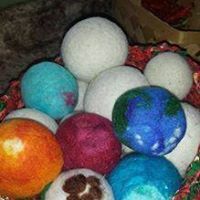 Roll the ball of roving in your hands like play-dough keeping it fairly damp and with a small amount of soap, keep applying gentle pressure and increase the friction as the wool becomes more firm. Begin rotating the ball of wool through a cold water and warm water bath, the change in temperature helps the wool to felt. At some point during this process all of the little hands may have wandered off. This is a great time for adult magic! 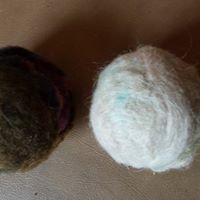 Take the ball of wool and put it into the nylon stocking, tie a knot to keep the ball in place and toss it into your washing machine with a load of laundry. It might take one or two runs through the washer till it feels firm enough. Throw the ball, still inside the stocking, into the dryer. You might find that some of the fiber has stuck to the nylon when you remove it, this is fine, if you would like a little more felting you can always rewet the wool and rub it some more. 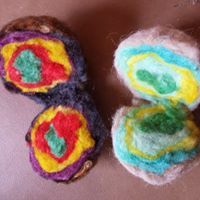 To reveal the beauty of your geode (this step is for an adult only) use sharp scissors or a box cutter and slice the ball down the center, it will reveal the rainbow of colors inside! This is very similar to the geode. Begin with a piece of wool roving and roll it into a ball. Dip it into the water and begin applying light pressure, rolling it in the palm of your hand. Continue wrapping roving around the center ball until you have the size you want. Remember that the ball will shrink as it felts. Get it wet and keep rolling it in your hand, add a little soap if needed to smooth your hands across it. Change the water temperature by dipping it into the cold water. Tie the ball tightly into a nylon, if you have multiple balls just keep tying them one on top of the other until you run out of balls or stocking. Toss it into the washer with a load of laundry and run once or twice and send through the dryer!